Pioneer is a high school work conference help each year during Pre-Camp, the first week in which the site hosts campers, or Conferees. Conferees help prepare the site for the remainder of the summer when more conferences will gather at the camp each Sunday for seven weeks until mid August. 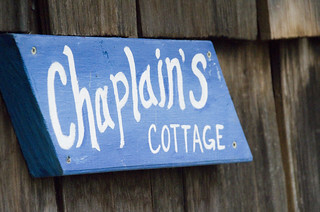 This year, seven high schoolers attended Pioneer and spent most of the week painting the windows and trim of the newly renovated Chaplains Cottage. They scraped, primed, and painted for several days. In addition to painting, the Pioneer crew help maintain the roofs of Cottage Row by removing moss and debris; and re-stained the Health and Welcome Center. JCT, formally known as the Joseph Clemmons Job Training Program, is a signature program of the Connecticut Conferences Racial Justice Program. The program seeks to introduce youth of color to the beautiful outdoor ministry space at Silver Lake Conference Center as well as provide skills for future employment. During pre-camp, the JCT trainees work along side camp staff, learning the same skills, safety procedures, and job expectations as the summer staffers. Following pre-camp, the JCT participant move to the Conference offices in Hartford to spend a second week learning more about working in a professional office environment. The program also engages the youth in exercises designed to encourage them to set high expectations for themselves and those around them. "Everyone was really welcoming," said Terrance, one of the 2017 JCT participants, talking about his time at Silver Lake. "And it was all about Team Work." "Now faith is the substance of things hoped for, the evidence of things not seen. (Hebrews 11:1) This scripture describes the work of the JCT program," said Isaac Monts, Director of the JCT Program and Program Associate for Racial Justice Ministry for the Connecticut Conference. "This year, 6 young men embarked on a journey to be excellent in everything they do. With determination and persistence, they got through the hardest part of the program (week 1) and are now beginning to see the fruits of their labor. As we finish our program in the CT Conference Office, I am excited about the level of excellence that these beautiful black and brown brothers are reaching. I thank God for the opportunity to instill excellence and hard work into a generation where these traits are lacking." Monts invites all to join these young people on Thursday, June 29 for the JCT Final Presentations at the CT Conference Office. To learn more about how sign your child up, visit ctucc.org/jct. The Silver Lake Summer Conference Season officially begins with Week 1, June 28 through July 1. There is still room for youth to register for other conferences this summer. You can find all information about these conferences by visiting www.silverlakect.org.